What high school/college do you attend? How did you hear about RYTF? The Rockaway Youth Task Force (RYTF) is a grassroots member-led organization principally comprised of young women of color within the Rockaway Peninsula in Queens, NY. RYTF builds power to secure social, economic and racial justice for residents of the Rockaway Peninsula and beyond. We are looking for an experienced, skilled and strategic Director of Communications. The focus of this role will be developing and implementing media, communications, and messaging strategy for campaigns aligned with our mission. 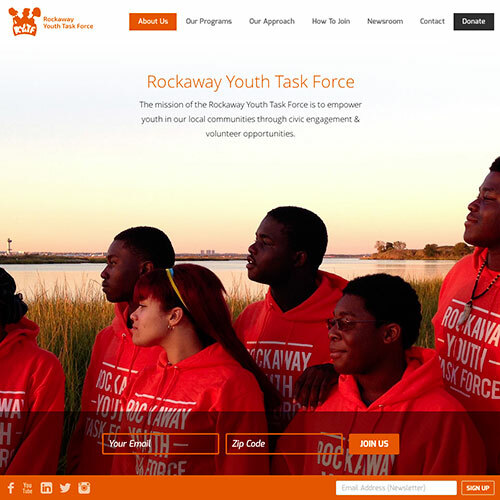 The individual in this role will be collaborating with Rockaway Youth Task Force staff and partners to implement a multi-tiered strategic communications plan that advances RYTF’s public policy, public education, organizing and programmatic objectives. This includes coordinating timely responses to emerging media opportunities, using digital and online communications to build public support for organizational priorities and managing the organization’s digital infrastructure. As a key member within of a small staff, the ideal candidate would be a strong writer and editor; has experience with digital/online communications and both traditional and social media; is committed to RYTF’s issues; flexible and effective in a fast-paced and evolving environment, and has a great sense of humor. Manage website, online properties and e-communications, including full oversight and execution of editorial calendars for our website, blog, e-communications and social media. Manage website design upgrades and changes. Conduct regular analysis and reporting of metrics to assess impact and inform communications strategy. Coordinate media outreach and responses to media requests. Coordinate materials/media production and distribution. Work with relevant staff, members and others to manage development, production, distribution and inventory of print and online materials (e.g. infographics, fact sheets, flyers, the Rockaway Advocate) and multimedia content for campaigns. Other Responsibilities (up to 10%) – Other responsibilities as assigned, including: Provide logistical and administrative support for projects and events; support and training to RYTF members related to their digital and online communications; and participate in staff/campaign meetings and other duties. Experience working with/organizing diverse communities directly affected by cycles of oppression including: communities of color, people of low-income, youth, Muslims, LGBTQ, homeless people, immigrants, women, and people with disabilities. At least 2-3 years of experience implementing multi-faceted digital and online communications strategies in a campaign setting, reaching various audiences (e.g. producing multi-media content and other materials, managing online and social media to advance campaign goals). Demonstrated experience as effective online campaigner, using Facebook, Twitter, Instagram and other social media outlets as organizing tools. At least 2 years managing dynamic websites, content management systems and online organizing tools. Excellent writing, research and communications skills, including demonstrated ability to analyze issues and think strategically; the ability to communicate complex issues clearly, concisely, and persuasively to a variety of audiences; the ability to write efficient in order to meet deadlines. Strong interpersonal and team skills with proven ability to help lead a team and work both in collaboration and independently. Flexibility in a small team, and excellent organizational skills. Should be creative, results and detail-oriented, with the ability to manage and prioritize multiple responsibilities within deadlines. Experience providing relevant technical assistance and training preferred. Application Deadline: This job is open until filled. Compensation: This is a full-time salaried position with a generous benefits package. The annual salary range for this position is $42K-$50K based on experience and qualifications. Most work will be be done 10:00am – 6:00pm, but schedule varies based on activities of the campaign, and this position will require working evenings and weekends, as needed. If you are interested email your resume to jobs@rytf.org.